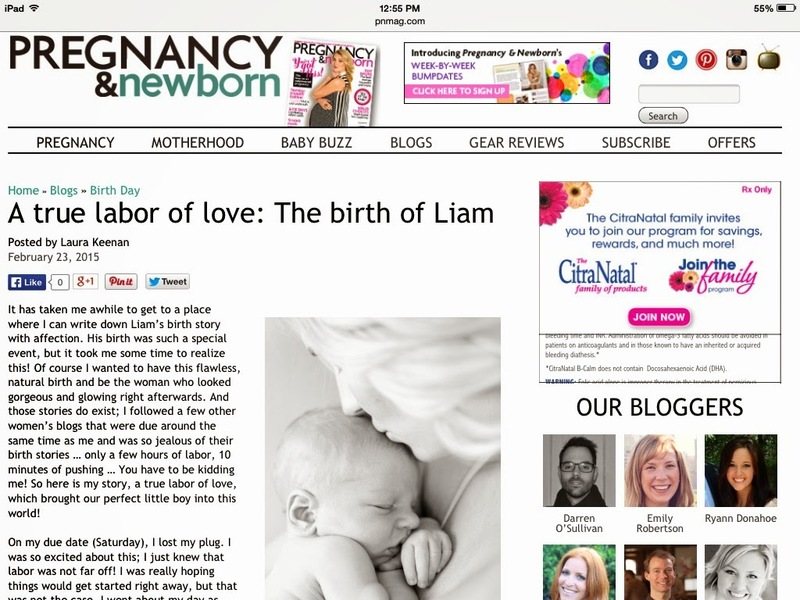 When Pregnancy & Newborn Magazine asked if they could feature Liam's birth story, I jumped on the opportunity! Too often I think women love to share "horror" stories with one another, instead of discussing birth in a beautiful, positive light. One of my favorite natural childbirth books is Ina May's Guide to Childbirth , because it is full of stories that encourage! So all this to say, that I love any opportunity to share Liam's birth story! And since there are plenty of new readers as of lately, I was due to repost about it. If you want the full version you can read my own post here, or you can go to the Pregnancy & Newborn Magazine blog and read a slightly condensed version there. I completely agree with you, all birth stories are beautiful because they bring such beautiful life into the world. I'm so happy you're story was featured. Congratulations! How cool is that! Congrats! How fun - congrats mama!!!!!!!!!!!!! LOVE! That is so awesome!!! Thanks for letting me know; it's fixed now! So cool and exciting!! Congrats lady. I'll definitely be checking this out! That's awesome! Way to go! Thanks! It was fun & exciting to be featured by such a big company! Aw this is awesome! And props to you for sharing your birth story...sometimes it can be really hard and emotional. Xo Chelsea play. wash. rinse. repeat. It was definitely hard to write, but I'm so glad that I did and now I love sharing it! What an amazing feature! Congratulations! Beautiful story and what a fun feature! It can be so hard to see other things work so well for others - everything from pregnancy to birth to parenting - but in the end, it's OUR story, for better or worse! I had a very long (4 day) induction, so I always get a funny look when people ask about it...It was definitely not what we planned, but it's what happened, and in the end, we have healthy little (big) boys now. Thank you for sharing your story!!! oh that is wonderful! And, I love birth stories. Oh this is so absolutely awesome Laura!!!!! I agree with you, it seems easier for people to share horror stories than it is to share the beauty of birth. So encouraging! Just realizing I have yet to post my birth story with Lily. Maybe I'll work on that in the upcoming weeks! ;) so excited for you!